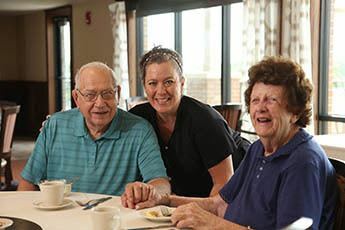 Residents of The Heritage at Sterling Ridge in Omaha, NE, enjoy beautiful senior apartments designed specially for their unique needs. Our senior living community is dedicated to enhancing the lives of our residents. 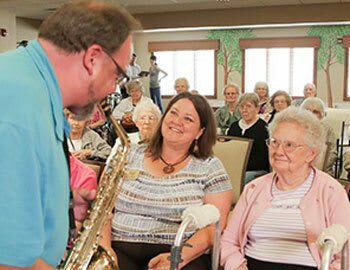 Whether relaxing in the privacy of your apartment or partaking in a community event, we help Omaha seniors live their best life. We offer a variety of daily activities and special outings, from live music and exercise classes to dining out at area restaurants. Our Life Enrichment Director keep the social calendar fun and engaging, scheduling activities based largely on resident input and suggestions. Have an idea? Just let us know. Family and friends are always welcome to join in the fun, too. Our restaurant-style dining features open dining hours so you can eat when you want, sit where you like and choose from a wide variety of delicious favorites and daily specials. Menus are posted in advance. One thing we guarantee—the coffee’s always fresh and so is the conversation. The dining room is the perfect place to gather with friends and family members, who are always welcome and encouraged to dine with us any time. We also have a private dining room for parties and social gatherings. Click here to view our sample menu.